Any Pokémon that comes in contact with this Pokémon gets food poisoning. 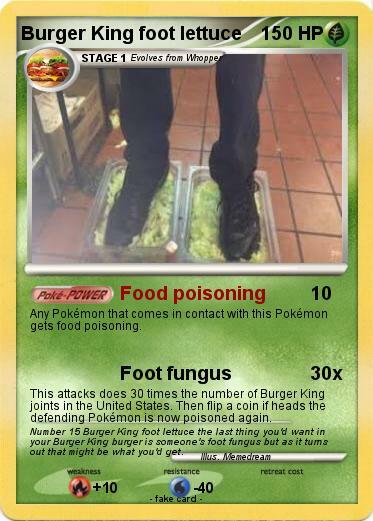 This attacks does 30 times the number of Burger King joints in the United States. Then flip a coin if heads the defending Pokémon is now poisoned again. Comments : Number 15 Burger King foot lettuce the last thing you'd want in your Burger King burger is someone's foot fungus but as it turns out that might be what you'd get.